Samantha Womack (Morticia), Les Dennis (Uncle Fester), Carrie Hope Fletcher (Wednesday) and Cameron Blakely (Gomez) will lead an amazing cast in this spectacular musical comedy. 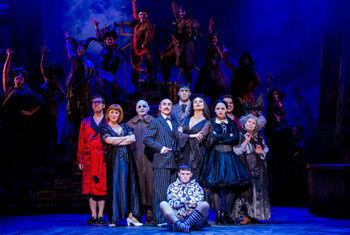 The ADDAMS FAMILY – THE MUSICAL is set to take over the Alhambra Theatre, Bradford from Tuesday 4 – Saturday 8 July. Samantha Womack left BBC1’s EastEnders after nearly a decade as Ronnie Mitchell. Samantha has also played Tanya Dawson for three series of the hit comedy Mount Pleasant (Sky1) and, on film she will be reprising her role as Michelle Unwin in Kingsman: The Golden Circle. Her stage credits include Nellie Forbush in the Lincoln Center Theater's Tony Award-winning production of South Pacific (Barbican Theatre & UK Tour), Michael Grandage's West End production of Guys & Dolls opposite Patrick Swayze (Piccadilly Theatre) and Peter Hall's production of Pinter's Betrayal (Theatre Royal Bath). Les Dennis spent the last three years playing burglar-turned-Romeo, Michael Rodwell, in ITV’s Coronation Street. His stage credits include She Loves Me, Me & My Girl, Chicago, Monty Python’s Spamalot and Hairspray. He took a hit one-man play Jigsy, to the Edinburgh Fringe and, in 2016, produced and starred in the sell-out 40th anniversary production of Alan Bleasdale’s Down the Dock Road at the Royal Court Liverpool. Carrie Hope Fletcher’s recent theatre credits include Eponine in Les Misérables (London and Dubai), Truly Scrumptious in Chitty Chitty Bang Bang (UK & Ireland Tour), Beth in Jeff Wayne’s Arena Tour War of the Worlds, and Wind in the Willows (Regent‘s Park Open Air Theatre). In 2015, Carrie released her first book, All I Know Now: Wonderings and Reflections on Growing Up Gracefully, and her second book, On the Other Side, was released in July 2016. Cameron Blakely’s previous theatre credits include the role of Thenardier in Les Misérables, a role he played for two years in London’s West End. Cameron was also part of the 25th Anniversary at the O2, where he played Bamatabois. Other credits include Smee in Stiles and Drewe’s Peter Pan at the Adelphi Theatre and Fagin in Oliver! at The Watermill Theatre. He has also appeared in many productions at Regent’s Park Open Air Theatre, including A Midsummer Night’s Dream, Hamlet, Romeo and Juliet and The Taming of the Shrew. Also joining the family is Valda Aviks in the role of Grandma Addams. Her previous theatre credits include Mrs Meeker in Funny Girl (Savoy Theatre/Menier Chocolate Factory), Barushka in Once (Dublin/ Phoenix Theatre) and Granny in Into the Woods (Regent’s Park Open Air Theatre). Charlotte Page will play Alice Beineke. Her previous theatre credits include the role of Christine in Phantom of the Opera (West End), A Little Night Music (Menier Chocolate Factory), the UK tour of Pygmalion for Theatre Royal Bath and Follies in Concert at the Royal Albert Hall. Dale Rapley will play the role of Mal Beineke. His previous theatre credits include King John (Rose Theatre Kingston), Richard III (West Yorkshire Playhouse), Women on the Verge of A Nervous Breakdown (West End), The Wizard in Wicked (UK tour), and A Midsummer Night’s Dream at Regent’s Park Open Air Theatre and for the RSC. Grant McIntyre will be playing the role of Pugsley Addams in his first UK tour, following recent roles in We are Here at the National Theatre and Bugsy Malone at the Lyric Hammersmith. Dickon Gough will play Lurch. His previous credits include Pirates of Penzance at Regent’s Park Open Air Theatre and on National tour, Carmen, Krol Roger, Guillaume Tell and Die Fliegende Hollander (Royal Opera House), and Dulcamara and L’Elisir d’Amore (Ravenna Festival, Italy). Oliver Ormson will appear as Lucas Beineke. Most recently, he played Elder Price in The Book of Mormon in the West End. In addition, the ensemble includes Kathryn Barnes, Jessica Buckby, Perola Congo, Gavin Eden, Jacob Fisher, Christopher D Hunt, Kirsty Ingram, Rhona McGregor, Scott Paige and Jak Skelly. Wednesday Addams, the ultimate princess of darkness, has grown up and has a shocking secret that only Gomez knows; she’s fallen in love with a sweet, smart young man from a respectable family! Now, Gomez Addams must do something he’s never done before — keep a secret from his beloved wife, Morticia. Everything will change for the whole family on the fateful night they host a dinner for Wednesday’s “normal” boyfriend and his parents. All the usual clan are present - Uncle Fester, Lurch, Pugsley et al.